Last Monday, I posted an image of a woman I found on Pinterest and called for an S.O.S. because I wanted to track her lipstick down. I didn't really expect to get "correct" answers, though I thought it would be fun to see everyone's suggestions. If you've ever doubted that the Internet is a powerful resource, you only need to read the comments on that post to ascertain your faith. Thank you to every one of you who gave suggestions, obsessed with me, reposted the photo in various forums to widen the search, and miraculously, tracked down the woman. I don't know how or what kind of search terms you used, but I need your research skills! Reader London Girl found a link that indicated the girl in the picture was a model, and another reader emailed me to let me know the exact show she walked in, with a link to the full makeup look. 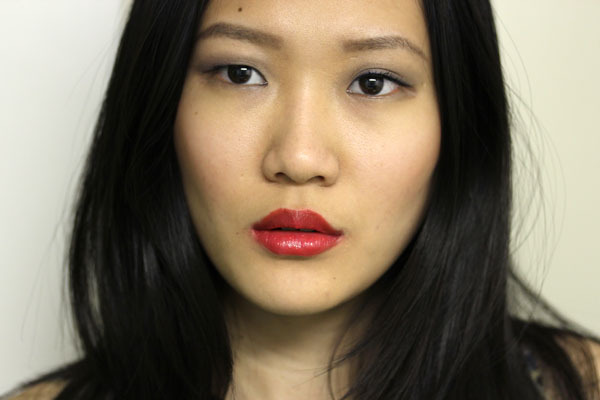 According to the Allure article, the model walked in the Dior S/S '12 show last fall. Unfortunately, the hue in question was not mentioned. Not to be deterred, I set out to recreate the hue. 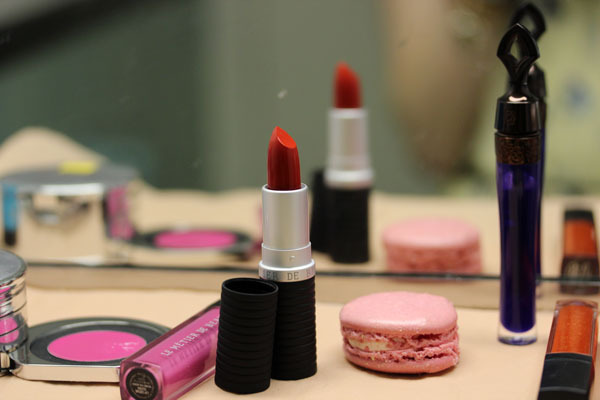 A few days after I saw that picture, I went to Bergdorf's and played around with some lipsticks. After trying a handful (and irritating a number of SAs with my nitpicking) to no avail, I went to the Le Métier de Beauté counter to mope. I looked at their lipstick selection and mentally started ticking the too reds and too pinks off. Nothing clicked, but at a whim I decided to try on Riviera. 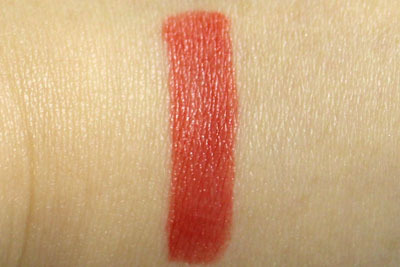 I knew from previous experience that it was a bright orange coral (the exact tone of Ken Downing's Kontagious Koral from last summer, except with sheerer texture) and it wouldn't fit, but I thought I might dab it on to my lips with a finger and see how it looked. It's not matte, but I think the shade is pretty close. 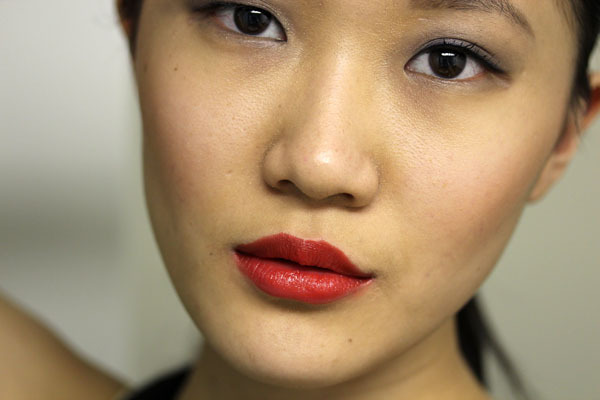 Besides, it's now apparent that the model had been sporting that lip for some time (the picture looks like it was taken post-show), so chances are after four hours my lips would look exactly like hers, right? Le Métier de Beauté Riviera Color Core Moisture Stain Lipstick retails for $32 and is available at Bergdorf Goodman, Neiman Marcus, Nordstrom, and Saks Fifth Avenue. But the whole point of this post is to say that you guys are the awesomest and I heart all of you! 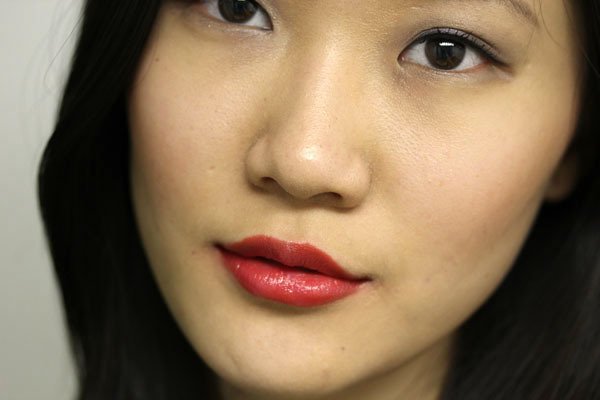 Gorgeous lip colour! I'm happy you were able to semi-figure it out! I'm in love with the color you came up with. It looks pretty dang close to the original too! I admire your determination :) Keep it up! I can't believe I missed that post! Magdalena Frackowiak is one of my favourite models <3. You must not read many magazines? Our gal Magdalena is a Vogue Paris fave and she is loved by many photographers and casting directors. She has walked a million shows, approximately. Give or take. Vogue Paris does excellent beauty eds and Magdalena is often featured in them. Very inspirational IMO. Ida- Haha! Guilty as charged. I don't subscribe to many magazines. To be honest though, I'm actually horrible with faces. I've probably seen her on style.com a million times but just didn't recognize her. I have no idea who she was either. I don't pay attention to the names of model. But I did like that colour too! Great job Cheekz! Taking a tip from your prior posts on mixing Lip Cremes and lipsticks, I tried Riviera and Sweet Creme and it worked on me. I have no pigment in my lips so I needed the heavier application of straight from the tube Riviera. Thanks for sharing how you finally achieved it. You know what...that is probably true. I can recognize a billion models it seems, and whenever I pass an ad on the street I can usually name the model...while my boyfriend is convinced that they are all the same skinny blonde Russian model, haha! Good sleuthing! This color combo looks absolutely lovely on you! Good sleuthing! This combo looks absolutely lovely on you.